Hartford. 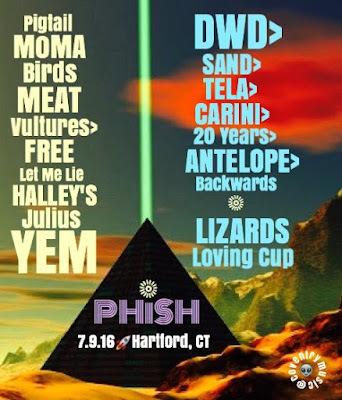 Phish returned to the great state of Connecticut to play a show at the old-school Hartford Meadows. This venue holds like 30K with a decent size lawn. The lot scene in Hartford has been historically raging with an anything goes attitude, so if that vibe continues that means everyone should be well lubricated going into this show. For half-baked updates, visit @CoventryMusic on Twitter. For memes/pics follow @CoventryMusic on Instagram. If we are lucky, then our Japhan pal Yas might stream tonight show on Mixlr. If not, check out Kush Bush. This is a gorgeous place, and I won't soon forget it. Attended an event here sponsored by the company. The reception hour was held in one of the rooms next to the hall. At Chicago event venues I loved the buttery mashed sweet potato.